Mary Alice Heuschel, 2011 AASA National Superintendent of the Year finalist, speaking at the 2016 Women in School Leadership Forum. Earlier this month, AASA, The School Superintendents Association, announced the finalists for the 2017 Women in School Leadership Awards. Co-sponsored by AASA and the Bill & Melinda Gates Foundation, these awards are designed to recognize leading female administrators who are making a positive difference for their respective communities as well as the students they serve. This year, we added a new category—the School Based Award—an award that provides a pathway for AASA to support more women educators in developing leadership skills and advancing their careers. 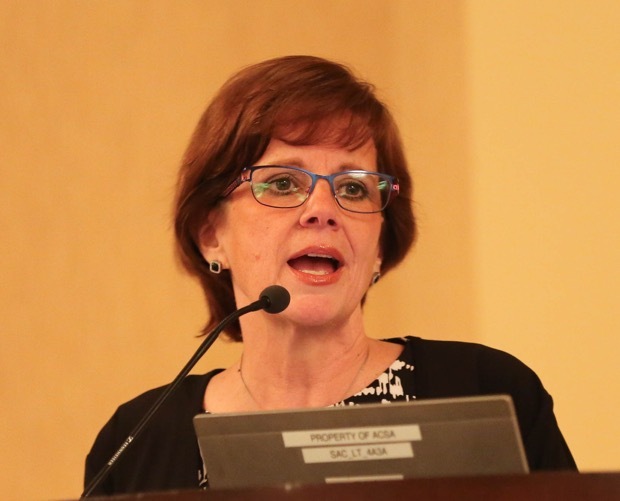 On the heels of this announcement, AASA collaborated with the Association of California School Administrators for the sixth annual Women in School Leadership Forum. Approximately 250 women educators convened in Newport Beach, Calif., in late September to network, discuss leadership and examine ways to climb career ladders. Fewer than 25 percent of America’s superintendents—the leaders of our nation’s public school districts—are women. It’s clear that a lot of work needs to be done to bring more women into leadership roles. Putting more females in leadership positions is essential if we’re going to raise the bar in our profession and send a signal to more female students who may wish to pursue education administration as a career. I am pleased that AASA is doing its part to grow the careers of women educators. In addition to our School Leadership Awards and Forums, we recently selected 20 accomplished women leaders from school districts across the country to participate in the inaugural cohort of the AASA Aspiring Women Leaders Program. The initiative was launched to help mitigate the impact of social barriers women face in ascending to the top leadership positions within our school systems and to significantly increase the number of women seeking and becoming CEOs and superintendents of schools. Opportunities to gain national visibility through presentations at AASA meetings and in webinars. All of these activities represent a longstanding tradition of AASA applauding outstanding female education practitioners. Through these programs and activities, we don’t expect it will be long before we see a decrease in the gender gap when it comes to education administration. For information about our Women in School Leadership programs and initiatives, please contact MaryAnn P. Jobe, AASA director, education and leadership development, at mjobe@aasa.org.